HANCOCK PARK MEETING speakers and officials included, from left, burglary Det. Joe Alves; Terry Segraves and Jerry Shaw of SSA, Nikki Ezhari and Rob Fisher of CD4, Greg Martayan of CD5, Capt. Tony Oddo, SLOs Kenneth Price and Dave Cordova, Councilmember Ryu and Marty Beck and Peter Gorelick of the HPHOA. Recent increases in criminal activity have alarmed residents, especially in single-family neighborhoods, where reports show an uptick in crime. As noted in this newspaper last month, the increases, primarily in property crimes and robberies, also have led the Los Angeles Police Department (LAPD) to reallocate about 300 officers, beginning in January, to patrol duty across the city. Each of the LAPD’s Wilshire (essentially west of Larchmont) and Olympic (basically east of Larchmont) divisions reassigned 10 officers to help patrol each area. Neighborhood association leaders have been organizing meetings to focus on crime, and what can be done about it. Local LAPD leaders have attended, as have private patrol company representatives. There was a meeting in Hancock Park on Feb. 6. Two days later, there was a meeting in Brookside (on Feb. 8.) The subject certainly will come up at the La Brea-Hancock annual meeting on March 4, and the Greater Wilshire Neighborhood Council has scheduled a special meeting on crime for all area stakeholders for March 14. There is more about both meetings on page 4. In a well-moderated meeting, arranged by the Hancock Park Home Owners Association (est. 1948), Peter Gorelick, the association’s security chair for the Neighborhood Watch Committee, welcomed about 60 residents and a dozen public safety personnel at the Third Street School auditorium Feb. 6. Gorelick introduced representatives from the LAPD’s Wilshire Division. (Hancock Park, like Brookside, is 100 percent within Wilshire Division’s jurisdiction.) Public safety experts attending to speak and/or answer questions were: Capt. Anthony Oddo, commanding officer of the Wilshire area; Joe Alves, who has headed the Wilshire burglary unit until being promoted and transferred to Downtown in late February; SLOs Dave Cordova and Kenneth Price (newly assigned to Wilshire SLO duty), ADT Security Services armed patrol representative Mike Ball; and SSA Security Group armed patrol representatives Jerry Shaw and Terry Segraves. 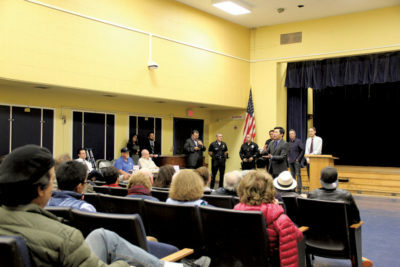 Early in the meeting, Councilmember David Ryu arrived and spoke, describing how the City Council’s increasing the LAPD budget has allowed for the hiring of new officers. Capt. Oddo responded that the recruiting and training of competent police officers is a time-consuming process and that only a small percentage of those who apply for the job ever graduate and are sworn in. Also, compact class sizes (of about 50 trainees each) are required, to give maximum supervision in training. Both Capt. Oddo and Det. Alves attributed some of the recent crime increase to the results of state propositions adopted in 2014 and 2016. 2014’s Prop. 47 provides for reduced sentences for drug possession and for thefts under $950. Prop 57 provides for early release of state prison inmates, and it also makes charging juveniles as adults more difficult. Capt. Oddo announced that leaders at LAPD headquarters recently had encouraged the local commanders to work more closely with community members and private patrol services to increase eyes on the street. Capt. Oddo said that local private armed patrol companies like SSA and ADT are helpful partners to the LAPD. Peter Gorelick wrapped up the meeting by giving the ADT and SSA representatives the opportunity to speak about the services they offer to local residents. Many similar themes were sounded at the Brookside Homeowners Association meeting two days later. A standing-room-only crowd of more than 50 people packed the community room at Memorial Branch Library. Resident Lew Shomer reported on a security survey he had undertaken, noting that a substantial number of residents said they would be willing to pay for private patrol service. Mario Escobar, of ADT Security Services armed patrol, spoke, and Kimberly Morosi, a community resources staff person in City Attorney Mike Feuer’s office, told about assistance she could provide to residents. Neighborhood Watch was a main topic of discussion. Brookside neighbors Peje Kharrazi and Guhan Selvaretnam told how they had organized some blocks on Mullen Avenue and Muirfield Road to communicate better with one another in all kinds of emergency situations. This approach was reinforced by Kari Garcia, visiting from Miracle Mile, who told of the active neighborhood watch organizing that she and her neighbors were doing with Wilshire Division officers. Representing those officers, SLO Hebel Rodriguez and burglary Det. Joe Alves addressed the meeting and took questions until the library staff said the building was closing and everyone had to leave.